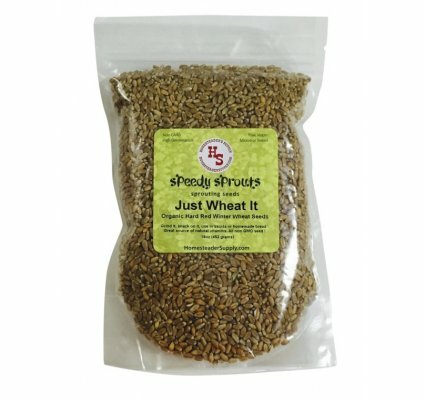 A customer asks: I’m confused about your Speedy Sprouts wheat sprouts. What do you do with them? 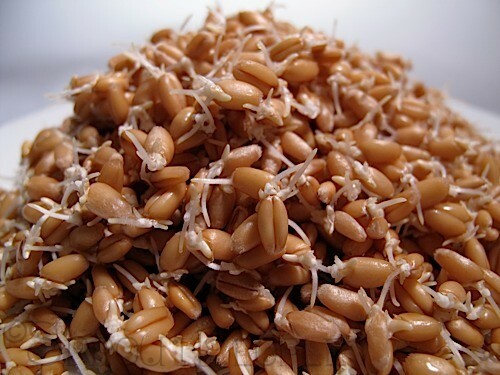 Jerri says: Just Wheat It, our organic hard red winter wheat berries, can be used in a couple of different ways. One thing you can do is bake your own healthy sprouted grain bread. For bread, you sprout the wheat just until the little tail starts to show. Then dry the sprouts and grind them in a grain mill. Bread made from sprouted wheat is easier to digest than store-bought flour and breads. 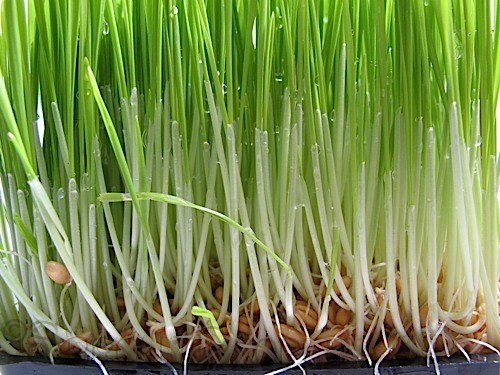 Or, the wheat can be grown as a grass in shallow soil on a flat tray. 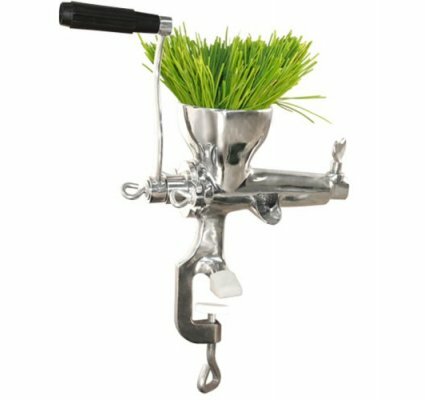 When the grass is ready, you can put it through a wheatgrass juicer to make a sweet health tonic. You can do the same with Bob Barley. This entry was posted in How-To, Sprouting and tagged how to, sprouts on December 14, 2015 by Homesteader's Supply. 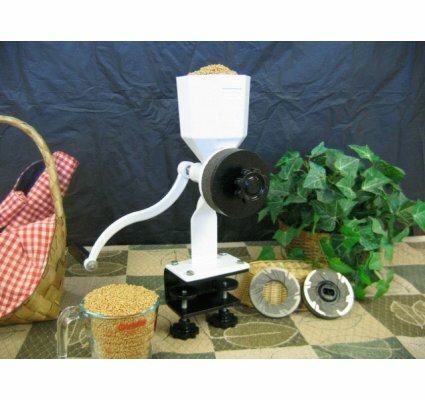 A customer asked: What’s the best grain mill for nut butters? An alarmed customer asked: Help! I’m grinding buckwheat to make flour and it smells like the motor is burning! Jerri’s answer: Don’t worry. It’s perfectly normal to get that funny odor when grinding buckwheat, in particular. A concerned caller asked: I was grinding my first batch of flour and found all these little black bugs in the flour. Jerri’s answer: They’re not bugs! It’s important to read the manual before you use your new grain mill. Because your mill came brand new, direct from the manufacturer, you need to mill a white grain like rice before you use it. Use the least expensive type of grain you have on hand, because you will be throwing it away. You are the first person using your machine and the inner metal parts have to be ground down the first time. When you break in your new machine, you’ll see tiny, black metal shavings in the flour. Mill a couple of cups of flour, until no more metal shavings appear. If the manufacturer did this for you, your machine wouldn’t be brand new when you receive it…it would be used! This entry was posted in Grain Mills and tagged grain mills, how to on December 14, 2015 by Homesteader's Supply. Holiday Gift Ideas – Stocking Stuffers! Need holiday gift ideas? Here are some of Santa’s favorite stocking stuffers! Does the holiday season leave you stumped when it comes to choosing presents for friends and family? Are you looking for a practical gift someone will actually use? Do you need the perfect something for the person who already has “everything”? There’s no need to wrack your brain when you can just order Homesteader’s Supply Gift Certificates for all the homesteaders and home cooks on your holiday list! You can’t go wrong when they pick out their own presents! 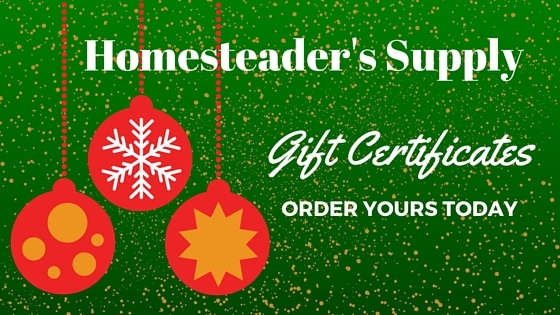 A Homesteader’s Supply Gift Certificate is hassle-free gift guaranteed to make your loved ones smile. Our gift certificates come in denominations from $25 to $200. Click here to order yours today! If you use some of the yogurt you made to inoculate the next batch, you will get a whole lot more batches out of these than the package states! Read how to do that here. 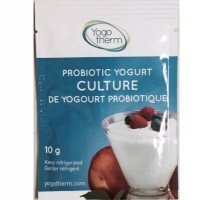 You can order our Bulgarian Yogurt Culture in single packages or 5-packs. Each envelope contains enough to inoculate 2 quarts (or liters) of milk. Our Danisco ABY-2C Thermophilic Yogurt Culture makes a thicker, sweeter yogurt. The small jar contains enough culture to make 8 gallons of yogurt. The large bottle makes 300 gallons! Kefir is easy to make, deliciously creamy…and super healthy! 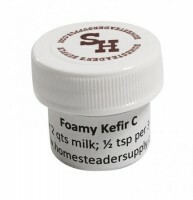 You use this freeze-dried concentrated lactic starter for direct milk inoculation. Jar contains enough to make 16, 2-quart batches! 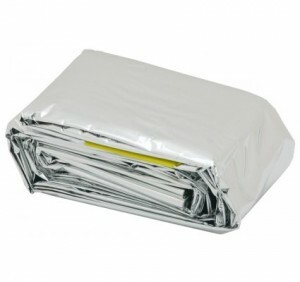 Also available in 100 gram size; just call us at (928) 583-0254. The flavor of a cheese is determined by the type of culture used, the timing of each phase, and the temperatures called for in the recipe. We offer a variety of cheese cultures from different countries, including Canada, France and Italy. You can purchase any of these individually. Liquid Vegetarian Rennet, 1 oz. Rennet is a coagulating enzyme produced by the fermentation of a purified culture of the fungal specie Mucor miehei. Ours is a Double Strength rennet that contains no animal products or dyes! Available in 1-ounce, 2-ounce, and 4-ounce sizes. Also available in tablet form in packages of 10 or 100. We also now carry liquid animal rennet. One difference is that animal rennet sets up faster. 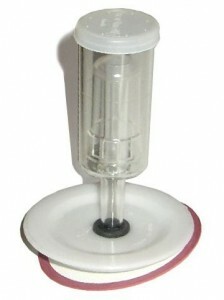 This is the ultimate tool for fermenting or canning! You’ll be finding amazing new ways to use it in your kitchen almost every day! The design is perfect for pressing veggies like cabbage to break up the fibers and release liquid. It’s also perfect for packing veggies into the fermenting vessel. Each end is sized differently for different needs. Made of Appalachian maple wood and seasoned with 100% raw organic coconut oil! Free Shipping within the lower 48 states! 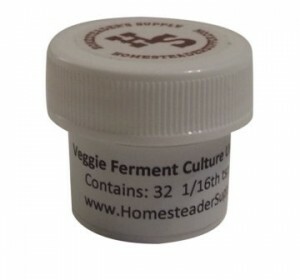 You need this starter culture to ferment raw vegetables for delicious foods like sauerkraut and kimchi. This freeze-dried lactic bacteria is manufactured by Biena, the maker of some of the best cheese cultures on the market. You can even use this culture to make butter, sour cream and even certain soft cheeses! Our exclusive Pickle-Pro Vegetable Fermenting Lids fit REGULAR and WIDE-MOUTH canning jars. Be sure to order the right size! 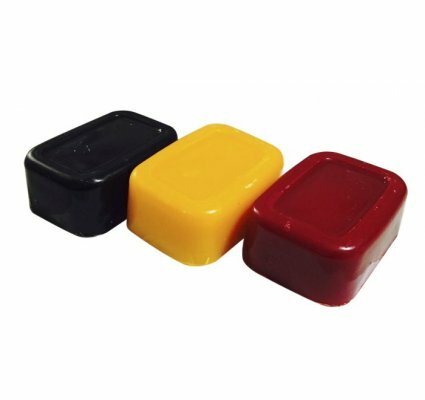 We provide the lid with airlock and a rubber seal, you provide the glass jars and the ring to secure it to the jar. When your bounty is fermented, simply remove the Pickle-Pro set up and seal your jar with a regular metal canning lid. Bonus Recipe for our yummy Garlic Dill Pickles included free with your order! Free shipping to the lower 48 states! Order a 3-pack and get free shipping to Alaska and Hawaii! Emergency shelter for you and your loved ones! Great for camping, hiking, boating, emergencies, etc. Don’t be caught without them, especially in winter. Make sure all your cars are equipped with at least one sleeping bag for each passenger. Sold in sets of four for better pricing! And, believe it or not, it’s small enough to fit in your Santa stocking! This is the one we use at Homesteader’s Supply and it’s fabulous! 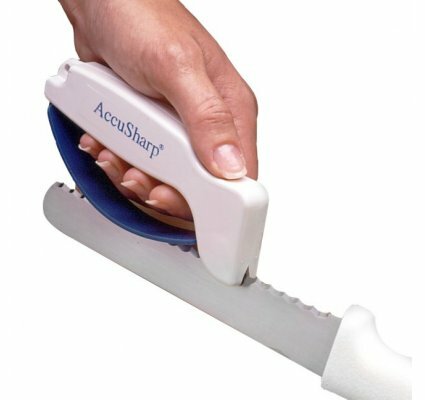 This knife sharpener works fast and is easy to use. Perfect for the kitchen, garden, or garage. Throw it one your pack, too! Great for camping. 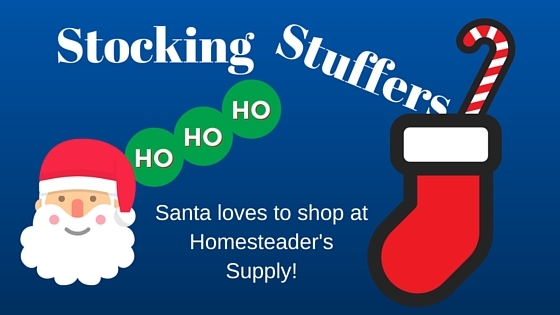 This entry was posted in Gift Ideas and tagged Gift Ideas, holiday, Stocking Stuffers on December 10, 2015 by Homesteader's Supply. Q&A: What Kind of Lamp Oil Should I Use? 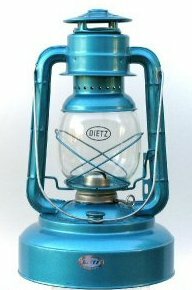 Question What kind of oil should I use in my lantern? Jerri’s answer You want a sootless, smokeless, and odorless lamp oil that burns clean. This type of oil is safe to use indoors because it doesn’t give off dangerous gas and won’t leave a residue on room surfaces. We recommend standard clear lamp oil (no dyes) or “Klean-Heat” Kerosene Substitute. DO NOT USE PARAFFIN OIL, DIESEL, BIO-DIESEL OR OLIVE OIL! These are not suitable substitutes for any of the approved fuels because they have a flash point of over 200 degrees Fahrenheit. You can find lamp oil in places like Walmart or large home improvement stores like Lowe’s and Home Depot. This entry was posted in How-To, Lighting and tagged how to, lamp oil, lantern, lighting on December 7, 2015 by Homesteader's Supply. Q&A: Why Does Cheese Wax Come in Different Colors? Question Why does cheese wax come in different colors? 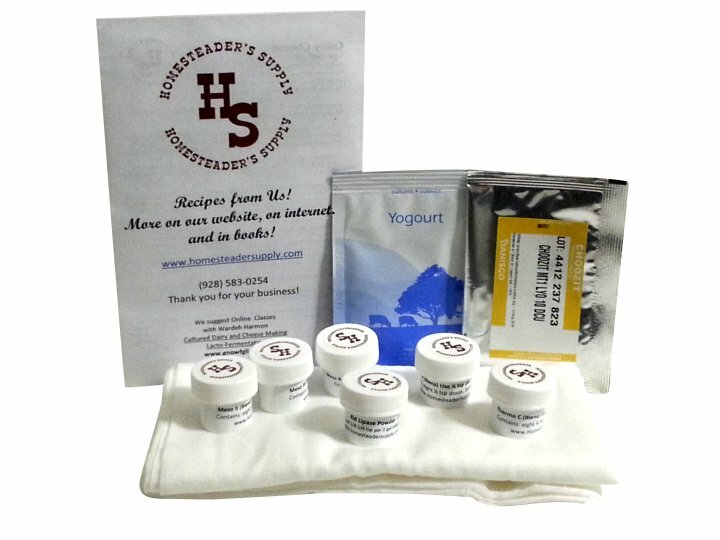 This entry was posted in Cheese Making, How-To and tagged cheese, wax on December 6, 2015 by Homesteader's Supply.